Envision, if you can, a technology that sharply improves the efficiency with which goods can be delivered to the consumer; that, in the view of one prominent economist, is the ”most effective innovation during the preceding decade in speeding up American retail sales”; that within only a few years of its introduction becomes a pervasive feature of American life. It doesn’t take long in Wellfleet to be impressed with the local lore. There’s a lot to learn, about native peoples, Pilgrims, pirates, psychiatrists, and painters. We hear about Baker inaugurating the banana trade, Marconi sending the first trans-Atlantic wireless, and Crowell inventing the paper bag. There is a little truth in this lore. However, as with any item in history, there’s more to the story than often claimed. One widely held idea, as evident in the quote above and some of the citations below, is that without Luther Childs Crowell of Wellfleet we’d never have the square-bottomed paper bag that makes shopping so convenient (and competes with the ubiquitous plastic ones). That’s an appealing story, especially for a small town that was in the doldrums during much of the industrial revolution. 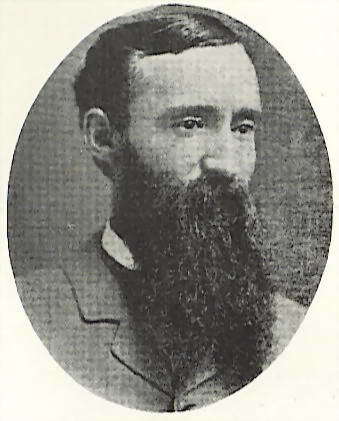 Although he wasn’t born in Wellfleet, Crowell became a prominent, long-time resident. He’s considered the third most prolific American inventor of the 19th century. Among his inventions were an aerial machine (helicopter), a double supplement printing press, and a bottle-labeling machine. He’s a figure to remember. Moreover, Crowell did play a role in the development of machines to make paper bags. He received one patent for this in 1867. Five years later he devised a machine to make square-bottomed paper bags, and later, the side-seam paper bag. But the story is a bit more complicated than one inventor working alone to develop his brilliant idea. 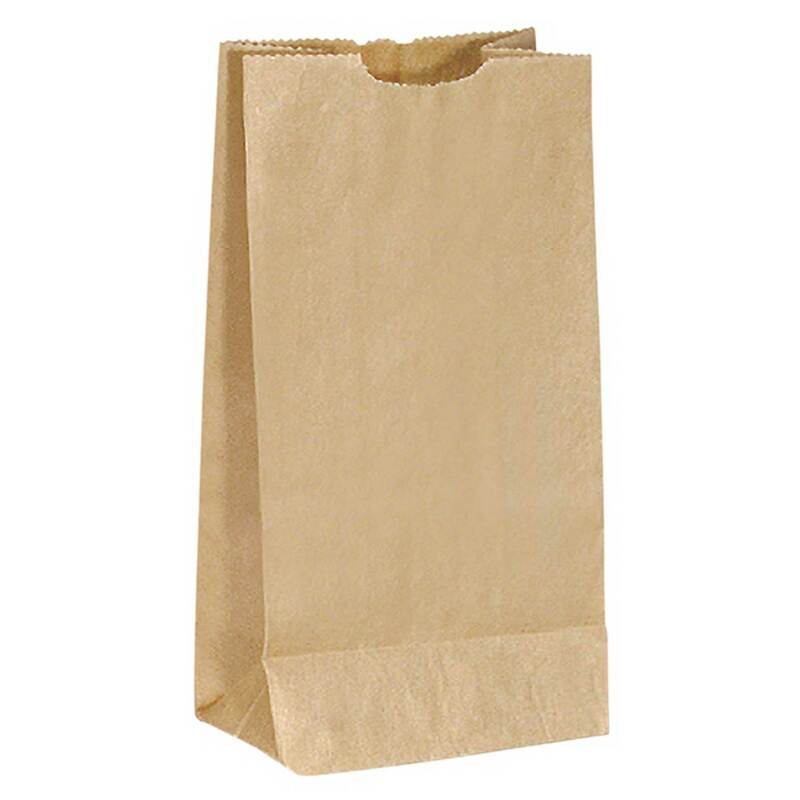 Paper bags were manufactured commercially in Bristol, England, starting in 1844. In 1852, Francis Wolle, of Bethlehem, Pennsylvania patented and built a “Machine for Making Bags of Paper” (15 years before Crowell’s first bag patent). In 1869 Wolle and others founded the Union Paper Bag Machine Company. Many people consider Wolle to be “the” inventor. However, Wolle’s was an envelope-shaped bag, which was limited in terms of durability and interior space. About then the plot thickens. In 1870, Margaret Knight designed a machine to cut, fold and paste paper bag bottoms. This meant that she could produce flat/square-bottomed paper bags, a great improvement on the earlier envelope-style bag design. Her work clearly preceded Crowell’s square-bottomed paper bag machine. Knight became the first woman to achieve a U.S. patent in her own name, one of 89 in all. She held patents for improvements to automobile engines, for a window frame and sash, and for a shoe-sole-cutting machine. Almost immediately, she became the first woman to suffer patent infringement. 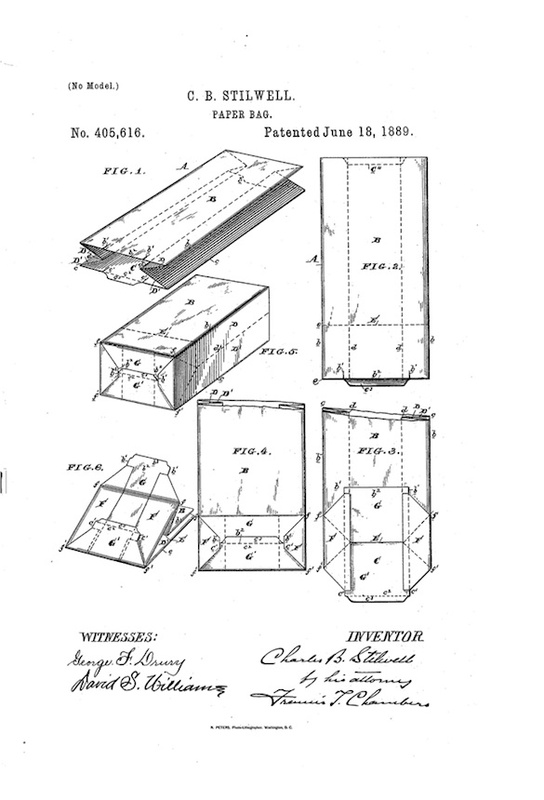 Charles Annan filed a patent application making use of her design. Knight then filed a patent interference suit. In the trial, Annan argued that Knight could not have been the inventor. As a woman, she “could not possibly understand the mechanical complexities of the machine.” But Knight had full documentation, with drawings, paper patterns, diary entries, and more, demonstrating the complex and detailed work she had done over two years. She prevailed in court. A decade later, in 1883, Charles Stilwell was awarded a patent for making a “Square-Bottom Paper Bag w/ pleated sides.” His design was nicknamed “S.O.S.” (self-opening-sack), and provided the model for the mass-produced paper bags we know today. William Purvis and others received paper bag patents, with improvements such as the thumb cut to ease opening, serrated tops, and handles. Note the use of the word, “improvement,” a sure sign that Crowell knew that he was helping the bag design to evolve, not inventing de novo. Crowell added several important features such as a bag top with unequal front and back sides. This made it easier to open the bag. He is thus rightly recognized as a major inventor, one who contributed to the design of paper bag we use today. Knight’s contributions were for a long time under-appreciated, no doubt in part because she was a woman. But now, there are scholarly articles, museum exhibits, PBS shows (“History Detectives: Women inventors”) and children’s books about her: Margaret Knight: Girl inventor, In the bag! : Margaret Knight wraps it up, and Marvelous Mattie: How Margaret E. Knight became an inventor. It’s impossible to identify the top paper bag inventor. Francis Wolle started on the path to mechanized production of the bags, but his envelope design had limited usefulness. Margaret Knight arguably made the biggest jump up from that with her machine for making flat-bottomed paper bags. But Stilwell’s significant addition of the accordion pleats on the sides made the bags much more useable, easier to store and access. Crowell’s work was important and still worth sharing. But the fuller story involving the first major US woman inventor, paper bags in different countries, patent battles, and the evolution of design for multiple purposes makes a truer and far more interesting account. Ament, Phil (2006, January 10). Paper bag. Troy MI: The Great Idea Finder. Brill, Marlene Targ (2014). 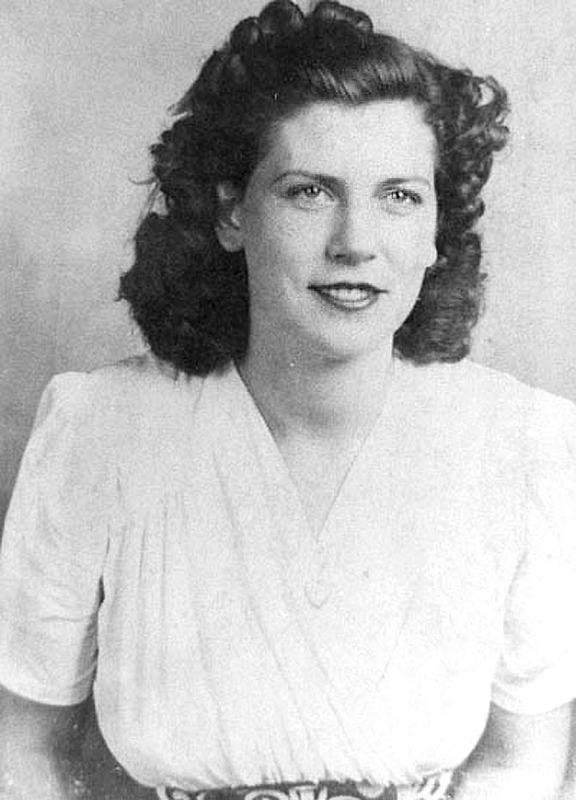 Margaret Knight: Girl inventor. Brooks. Walter (2015, February 20). February 20 – 1873: Luther Crowell of Wellfleet invents the brown paper bag. Capecodtoday. Herring, Susan Davis (1999, March 4). Women in the history of technology — women inventors. Presented to the Society of Women Engineers, Huntsville chapter. Krugman, Paul (1997, September 28). Technology makes us richer; the paper-bag revolution. The New York Times. Kulling, Monica (2013). In the bag! : Margaret Knight wraps it up. McCully, Emily Arnold (2006). Marvelous Mattie: How Margaret E. Knight became an inventor. Museum of Modern Art (2015). Flat-bottomed paper bag. National Women’s History Museum (2015). Margaret E. Knight (1838-1914). O’Connor, Aidan (2010, November 3). In the bag. Petroski, Henry (2003, Autumn). The evolution of the grocery bag. American Scholar, 72(4). van Dulken, Stephen (2006). Inventing the 19th century: 100 inventions that shaped the Victorian Age, from aspirin to the Zeppelin. NYU Press. This entry was posted in Cape Cod and tagged history, invention, paper bag, technology, Wellfleet, WHSM, women's history. Bookmark the permalink. Your article does a good job on the complicated nature of claiming invention. Thank you for it. Your picture of Margaret Knight, however, appears to be of a woman circa 1940 (based on the hair-style and outfit) rather than a woman born in 1838 (the year of Knight’s birth). Unfortunately, a brief search on the net failed to bring up any photographs of Knight except for yours. Nice piece of research. Honor where honor is due.